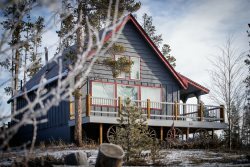 Breckenridge ski in - ski out lodging ranging from studio - 2 bedroom slopeside condos. Easily access the mountain from your condo! Take a lunch break in your fully equipped condo with kitchen, warm up and go back out for some turns. After your day of skiing enjoy the hot tub or year round heated pool onsite. Once you have relaxed and refreshed, walk steps to the free shuttle to be whisked away to Main St. Breckenridge. Here you find dining, shopping, and entertainment.